District 5’s newest representative is Christina Olague, the car-free president of the SF Planning Commission and noted progressive activist. Advocates say she holds promise as a champion of livable streets and sustainable transportation on the San Francisco Board of Supervisors. “Her values and expertise are going to be invaluable as we transition into San Francisco’s post-redevelopment era, and in our continued quest to make San Francisco more affordable, equitable, and sustainable,” said Tom Radulovich, the executive director of Livable City. San Francisco Mayor Ed Lee announced the appointment Monday morning before joining Olague on a merchant walk along upper Haight Street, where she told Streetsblog that she would make pedestrian and bicycle improvements in her district a priority, along with extending parking meter hours. “I want to start talking about all those issues right away,” she said. Olague will join her first Board of Supervisors meeting this afternoon, representing District 5, which is comprised of neighborhoods including the Western Addition, Hayes Valley, the Fillmore, Haight-Ashbury, Inner Sunset, and NoPa. She succeeds former Supervisor Ross Mikarimi, a strong advocate for livable streets who left his seat vacant after being sworn in as sheriff on Saturday. In a statement, Mayor Lee praised Olague for “spearheading plans for growth and development in San Francisco and developed policies related to land use, transportation and neighborhood planning.” Some reports have pointed out that she co-chaired the “Run, Ed, Run” campaign, though Lee claimed that it “clearly” wasn’t just that which influenced his decision to appoint her. 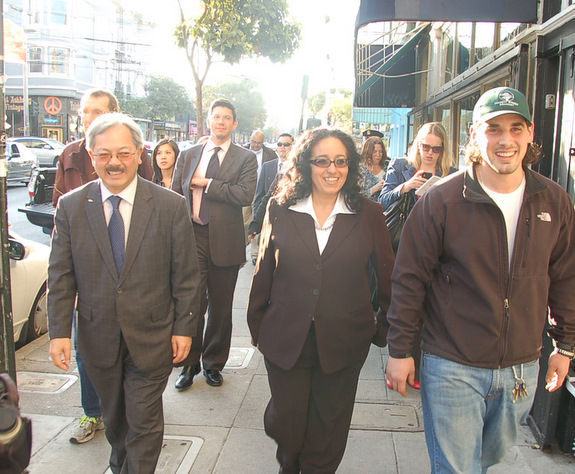 Mayor Ed Lee and Supervisor Olague walk down Haight Street. “I look forward to working with her to ensure that our transit policies move the city in the right direction,” he said. “This is a critical time to continue strong leadership in District 5 as long-awaited improvements for safer streets and better neighborhood connections move forward, including the Fell and Oak Streets separated bikeways, the Masonic Avenue redesign, and traffic calming in the Lower Haight’s Wiggle route,” she added. Olague said she would prioritize those projects as well as extending parking meter hours, which she noted would encourage parking turnover and provide revenue for transportation improvements. “It’s something we really need to engage people in, because it’s one of those really heated issues,” she said. Olague, who lives in NoPa without a car, is a regular Muni rider and has firsthand experience with pedestrian and bicycle conditions in her district like those on Fell and Oak Streets. “If you cycle, walk, or take Muni, your perspective on a lot of these issues takes on a different light,” she said. Olague is both an opportunist and an ideolgue, depending on the circumstances. As a Planning Commissioner, she voted to implement the Bicycle Plan part even though it had had zero environmental review, which was clearly illegal as the subsequent litigation showed. Hard to believe that a Planning Commissioner didn’t know about CEQA, the most important environmental legislation in California. With Mirkarimi and Kim, she dumped the Green Party when Obama and the DCCC made being a Democrat fashionable again. Of course she’ll vote to screw up traffic on the Panhandle and on Masonic Avenue. And she voted to maintain the Harding Theater as a derelict eyesore in the middle of Divisadero Street. Fell/Oak and Masonic will continue to have the support of the D5 supervisor. Great news. Start living in the present and thinking about the future, my friend. The era of cheap oil, freewheeling pollution and dominance by the automobile is coming to a close. Rob Anderson everyone in D5 is sick of you! My dear Jennifer, please let us all know if anything I wrote about Olague is untrue. I suspect, by the way, that a lot of people in D5 are also sick of you PC progs and your relentless quest to screw up their streets. jennifer, I wouldn’t worry about him. D5 will be led by someone who supports Fell/Oak and Masonic. Rob can continue to scream into the interweb’s wind, but things will get done on the ground. Let Olague know that you support cycling and the improvements on the table and we’ll just keep making the city a better place. Jennifer: Please stop attacking other posters and make a post that is on topic. If you aren’t willing to do that, then STFU and go away. Christina had been an excellent Planning Commissioner, one of the new crew of “pragmatic progressives” that get things done, consider projects on their merits rather than ideology, and do what’s best for the City. She is willing to talk about extending parking meter hours, something other progressive supervisors have avoided as political poison. Courageous and forthright, she’s a welcome addition to the Board of Supervisors.And kudos to Ed Lee for appointing someone a bit out of sync with his agenda, but the right person. Good news for friends of livable streets! Thank you, Supervisor Olague, for getting around town without a car and for supporting the extension of parking meter hours. Why is extending meter hours considered a brave position? The Inner sunset really needs to not be in District 5 – basically they gerrymandered our neighborhood so that you can literally walk a few blocks and be in D7…it’s not good for the inner sunset and not good for anyone. I wish they’d change it but they won’t. Well, because of the misinformation out there (e.g. District5Diary).